The HP DesignJet T770 44-inch printer, designed for small teams, will accomplish more yield in less time. The set-up of the printer is straightforward and prints without the need for opening applications. The upgrade-ability of the sharing, speeds, and options will satisfy the evolving needs of various companies. The price of the HP DesignJet T770 44-inch printer will be around 2,300-8,000 dollars. Administrators secure their life easier with the printer, and the printer is ideal for technical and graphic workgroups. 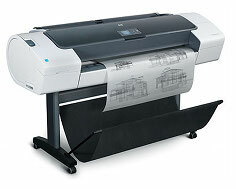 The HP DesignJet T770 44-inch printer is quite wide at 70 inches, 28 inches in depth, and 41 inches in height. The wideness of the printer is attributed to the large documents it can print. The print-rate of 80 A1 pages per hour gives it an average of 50 seconds to print a colored line drawing A1 document. The print-rate for black-line drawing is 80 prints per hour. The firm file processing memory incorporates two Giga Bytes and 385 Mega Bytes of RAM. The HP DesignJet T770 44 inch printer utilizes an HP Thermal Inkjet with HP Color Layering technology for resolution. Maximum output relies on the operating system and software used. The line accuracy of +/- 0.1% is shockingly detailed in the resolution. The printing peaks can be accommodated in working environments that have tight deadlines. The Economode setting permits fast printing-rates and the HP Instant Printing allow batch printing without the complexity of applications. The established connections used on the HP DesignJet T770 44-inch printer can be the Fast Ethernet 100 Base-T, EIO Jetdirect accessory slot, or the Hi-Speed USB 2.0 port. Unlike, the HP DesignJet Z5200, the HP DesignJet T770 44-inch loads paper from the top instead of the rear. The printer can be easily pushed up against a wall. When the printer receives media paper, the printer will automatically rearrange the media if the media loaded is slanted. The HP DesignJet T770 44-inch will handle over 29 types of media formats. The types of media normally used in paper handling will be bond and coated paper, backlit, photographic paper, technical paper, and self-adhesive. When the printer finishes the printing process, it dishes out the paper through the sheet feed, automatic cutter and roll feed. The metric rolls of standard media supported will be the A4-A0-sized sheets; they are 27.94-111.76 centimeters. The 800 MHz Intel M Processors and the two Giga Bytes worth of dedicated file processing memory makes the printer solid in its performance. The HP DesignJet T770 44-inch printer is supported with modern operating systems; Windows Server 2003, Windows Server 2008, Windows XP, Windows Vista, and Windows 7. The 32-bit and 64-bit versions of Windows operating systems will work with the printer. Novell NetWare 5.x and 6.x will support the printer. Mac OS X versions 10.4 or later is compatible as well as the Citrix XenApp and Citrix XenServer. The Serif PosterDesigner Pro with different programs for a web entrepreneur and business organization will be included in the package upon purchase. Typically, the Serif PosterDesigner Pro cost around the area of 600-700 dollars. The software includes over 200 professional templates. The templates can be manipulated in the layout with Portrait, Portrait Banner, Landscape Banner and Landscape. The user has the option to edit and customize the print to suit his needs. The interactivity and navigation of the Serif PosterDesigner Pro is quite fluid and straightforward with a plethora of customization features. The HP DesignJet T770 44 inch printer weighs 180 pounds. Unless you are a bodybuilder, you will not be lifting the printer with ease anytime soon. Review it: "HP DesignJet T770 "
The HP DesignJet T770 44-inch printer will use six different HP 72 ink cartridges; cyan, magenta, gray, matte black, yellow, and photo black. They are easily installed on the left-hand side under the cover. 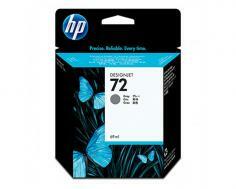 The cost-effectiveness of the HP 72 ink cartridges goes without saying.